I grew up in Cincinnati. As an outdoorsy person it can be a bit of a struggle living here and I often dream of moving to areas with better trail running and hiking. I love getting off the beaten path, especially in the mountains and along big rivers. Some of my favorite places to trail run are Asheville in North Carolina, Estes Park in Colorado, Santa Cruz in California, Red River Gorge in Kentucky and the Leelanau Peninsula in Michigan. Although I love to travel to these beautiful places, I am very thankful we have some amazing parks right here in our city! I am excited to share my 5 favorite places to trail run near the center of Cincinnati and why I love these spots. Grab your trail running shoes or hiking boots (or if you’re like me, your chaco hiking sandals) and go check these out! Ault Park is my favorite trail in Cincinnati because it is super accessible and central. Though the trail system is only about 4 miles, it offers some great technical and challenging hills which make for stellar training. Another great quality for people living in or around the surrounding neighborhoods is the ability to run from home making a longer 8+ mile run. If I am looking up put in some miles while training for a longer race such as a 50k or marathon I will run from my home in East Walnut Hills to Ault Park, loop around the trails and then head home for a 15+ mile run. Mt Airy boasts the most trail mileage in our city. Did you know The Stone Steps 50k, Cincinnati’s only ultramarathon, takes place there every October? That’s right! You can rack up 31 miles in this beautiful park. The race combines a 5.3 mile loop 4x with a 3.3 mile loop 3x. Mt Airy makes for great training grounds if you want to log big miles and stay on the trail. Be sure to bring a friend with you as it is easy to get lost on these trails! French Park is the most central park in Cincinnati and has about 4 miles of trails. The trail system is somewhat technical, but not too hilly so great for intermediate trail running. My favorite section of the trail runs along and criss crosses the creek. It’s really pretty and quite fun to hop the rocks across the water. Be careful as it can be slick on the rocks! Red Bird Hollow is the best beginner trail in Cincinnati. It is a 3 or 4-mile out and back gravel trail in Indian Hill. You can begin the trail at Indian Hill Church or the baseball fields at Stephen Park. This is the perfect trail to enjoy with a friend and your furry friend. The trail is wide, so you can walk easily with a friend and talk. Everyone brings their dogs and lets them off leash. Your pup will have a great time at Red Bird Hollow! If you are feeling adventurous, check out the side trails down by the stream. 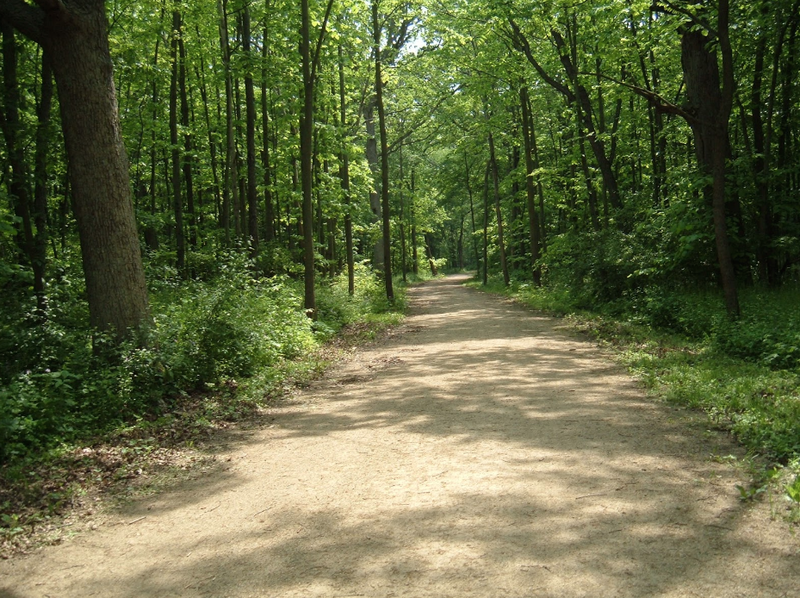 This is a newer trail to me and is located in Mariemont. It is super easy running as it is flat, but a really sweet and scenic trail. I love looking at the community gardens and field of flowers and grasses as I walk or run. Make this a short trail run or hike of 1.5 miles or do it twice for 3 miles. You can pick up the trailhead by parking at the Mariemont Swim Club and then head under the bridge to find the start. Get out and enjoy my 5 favorite trails. Remember to wear trail running or hiking shoes, bring some water and grab a friend! Trail running and hiking are always more fun with a buddy. This is where some of the best conversations I have had happen! Enjoy.